Egyptian has been delivering office procurement solutions for over 130 years in Southern Illinois and the St. Louis, Missouri region. They are very passionate about helping their clients optimize business processes through a vast range of solutions, from office supplies, space planning and furniture/building design to stocking break rooms. 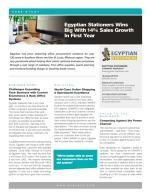 A non-user friendly shopping site and stagnate back office software drove Egyptian to seek out a better technology partner to help them grow their business.